and it’s believed to be a sacred plant. 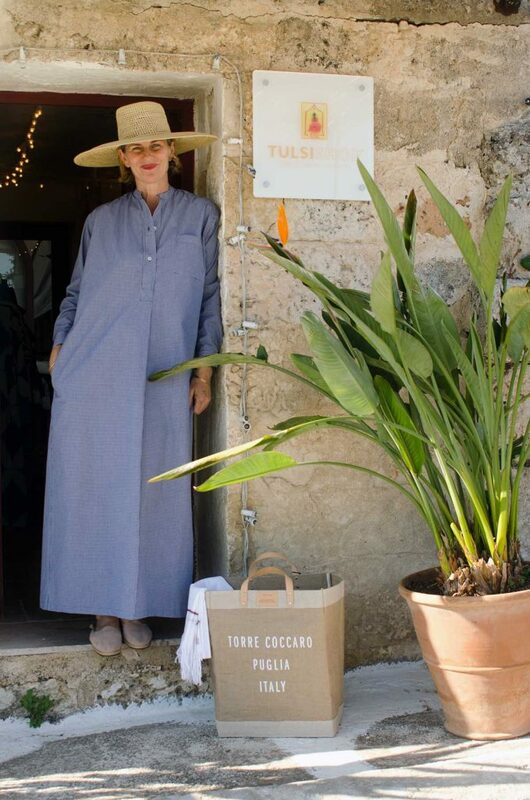 Deborah Nolan, Tulsishop’s founder, is a traveller and a free spirit and she has been searching for beautiful things all over the world. A few years ago, after wandering between India, South America, California and Indonesia, she has settled in the village of Marittima and made it her home. Tulsishop was then born. Here you will find Deborah’s summer collection of high-end cottons in natural colours, hand block printed kaftans and unique fabrics, vintage ethnic clothes and accessories from the private collection that she has gathered around the world during her journeys. Tulsishop believes in ethical and fair trade fashion. We aim always to be a responsible and sustainable venture.